Microsoft's decision to make Windows 10 a free upgrade could put the new OS on more than 350 million PCs within its first year, an analysis of user share data shows. About two-thirds of all personal computers running Windows 8.1 will take the upgrade bait in the first 12 months. A smaller but still significant percentage of Windows 7 PCs will add millions more to the Windows 10 tally, even though nearly half of those systems are in commercial or government settings, where upgrading is not left to workers. These calculations were based on the performance of Windows 8.1, the free upgrade Microsoft shipped in October 2013 as the follow-up to the original Windows 8 of 2012. According to Net Applications, a California company that measures operating system user share by tracking unique visitors to its customers' websites, Windows 8.1 (free) has gained share much faster than its predecessor, Windows 8 (not free) did after its debut. In October 2014, a year after Windows 8.1's launch, 65% of PCs running Windows 8.1 or Windows 8 ran the former, an increase of about 15 percentage points from six months earlier. While Windows 8.1 took three times longer than it took Apple's OS X Mavericks to reach 65% of the aggregate share of it and its Mountain Lion and Lion predecessors -- Apple's free OSes have become the benchmark of an upgrade's uptake -- Windows 8.1's adoption has been unprecedented for a Microsoft operating system. As Computerworld reported last year, "cheap is better than pricey, free is better than cheap" when it comes to personal computer operating systems. Microsoft has come to the same conclusion: Two weeks ago, it announced that Windows 10 would be available as a free upgrade to all machines running Windows 8.1 or Windows 7 SP1 (Service Pack 1), hardware permitting and exclusive of the Enterprise SKUs used by the largest customers. 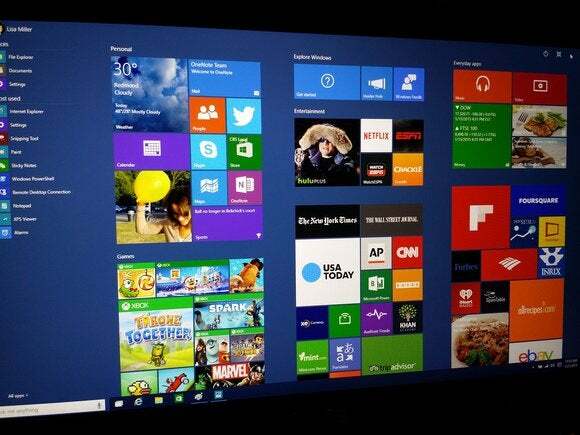 The free upgrade will be available for one year following Windows 10's official release, now slated for later in 2015. Terry Myerson, Microsoft's top OS executive, explained the free deal as a way to manage Windows' fragmentation -- users on a plethora of editions -- and a boon to app developers. "This fragmentation makes it challenging for developers to delight our customers with applications," Myerson argued. Analysts believe that there's more to it than that. With Windows revenue declining due to giveaways to OEMs, Microsoft needs to sell services and apps to make up the shortfall. Because Windows 10 will clearly be Microsoft's monetization platform, the more customers it can get onto the new OS, and the faster that uptake tempo, the better the chance, as the company's COO has said, "to monetize the lifetime of that customer through services and different add-ons [emphasis added]." With Windows 8.1 as a guide, Microsoft should have no trouble matching that cadence with Windows 10. In other words, if Microsoft launched Windows 10 in October, it should be able to get nearly two-thirds of all Windows 8 and 8.1 PCs (as of that month) onto the new OS by the end of the one-year upgrade span. Computerworld's forecast does not explicitly take new machines into account -- most research firms predict that shipments will stabilize at or slightly under 300 million for the next several years -- but only OS adoption. In many if not most cases, a new OS is acquired on a new PC; those, of course, are part of the uptake metric measured by Net Applications. Figuring Windows 7's migration is trickier. Researcher IDC says that approximately 55% of all PCs are in the hands of consumers, 45% in commercial organizations. If that ratio applies to Windows 7 -- which accounted for 61% of all Windows PCs last month -- that means consumers' systems represented about 34% of all Windows 7-powered machines. Commercial PCs would be discarded from the projections: Businesses don't upgrade at the same pace as consumers. Even though they will have to eventually upgrade to Windows 10 -- the enterprise standard, Windows 7, exits support in January 2020 -- they probably won't begin seriously upgrading until 2018, with the early birds jumping on it in 2016, according to Gartner. So business PCs are off the table. It would be foolish to assume Windows 7 PCs, even those owned by consumers, would upgrade to Windows 10 at the same rate as those running Windows 8/8.1. Windows 7 runs on more than four times as many systems as do the newer OSes, and moving that massive number will be difficult. But even a "discounted" percentage that does upgrade within the first year would be an enormous pool of machines. 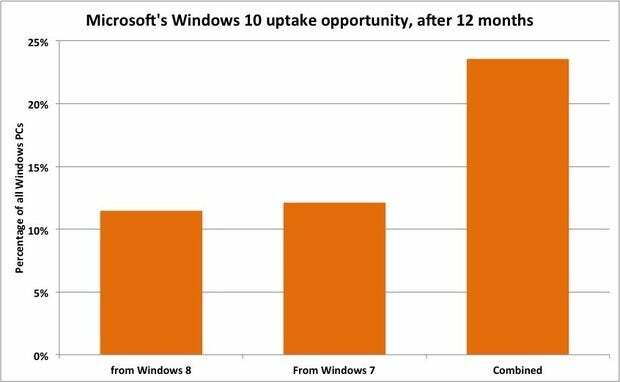 If, say, consumer Windows 7 PCs were upgraded to Windows 10 at just half the rate of Windows 8/8.1, and the upgrades begin in October when Windows 7 should account for 67.5% of all Windows systems, 12.1% of all Windows machines would migrate to the new operating system within 12 months (67.5% X 55% for consumers' part of the total X 32.5% upgrade rate, or half the 65% of Windows 8.1 in a year). Combine that with the 11.5% from Windows 8/8.1 -- by October 2015, the OSes' share should have climbed to just under 17.7% of all Windows machines -- and Windows 10 would be on a total of 23.6% of all Windows PCs. That would be an upgrade speed record for Microsoft, beating even the 20.1% uptake of Windows 7 in its first 12 months. Assuming an estimate 1.52 billion Windows PCs worldwide, the 23.6% translates into 358 million machines, or more than five times the number of Macs currently in use. "With Windows 10 we think of Windows as a service," said Myerson two weeks ago. "Windows 10 changes the rules of the game and redefines the relationship between us and our customers." Microsoft should be able to put Windows 10 on almost a quarter of all Windows PCs -- representing about 358 million machines -- in just 12 months through its free upgrade.